Getting To The Front Edge Of The Meseta . . .
Wednesday,September 18, 2013 The walk out of Burgos is nearly as confusing as Brierley makes it out to be. I stop at my now favorite cafe for my last dose of breakfast eggs on the way out, and ask the waitress. “Camino aqui,” as she points. So I go in that direction. I see one yellow arrow, and then nothing. After every few blocks, I ask a Burgos resident, “Donde esta Camino?” My Spanish is so very rudimentary, but I can manage to make myself understood, which I’ve learned is all that counts at this stage. The someone points here or there and I go. Sometimes there is a yellow arrow and sometimes there is just hope. Occasionally the person I ask looks around, grabs another person and asks advice. Then they both beam in on one or two more neighbors and they get together in a circle to discuss which way is the correct way. In rare moments, another peregrino passes me with the confidence that is so awe-inspiring, I am propelled to follow him or her or them. Of course I do get out of town, and feel pretty good about the route, walking on gravel paths among bushes and high weeds. Nothing very pretty, just whatever is there at the moment. After awhile, I come to a crossroad, and there is clear signage to the left. But an old man on a bicycle stops and tells me in Spanish that my way, the one with the sign, is longer, and that if I want to go on the traditional route, I have to go to the right. I am nervous because to the right is also what looks like an interstate in the not-so-far-away field. I hesitate. Now two Camino bicyclists stop and listen to the one-sided conversation. They are Spanish, so an artillery-rapid-fire exchange ensues. They explain what he told me already, and I explain to them that I’m a bit nervous to be out here in the middle of nowhere as a solo trekker, going in the opposite way of all the signs. So they pedal off, the old man shakes his head at me (“foolish woman . . . I’ve done this five times already . . . I know the way.”), and he too leaves me in his tire dust, back the way I came. 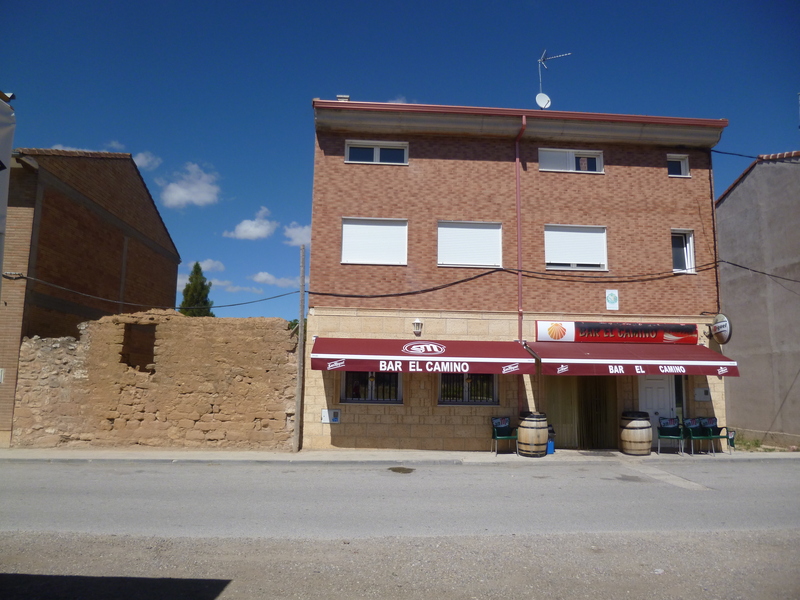 And what I need as I approach Tardajos, the next town emerging around the bend, four hours into the walk, is a Pharmacia. I see it, right on the main street, and it is actually open! I will let you imagine the exchange between me and the female pharmacist, neither of us speaking a word of the other’s language, and our pantomime is witnessed by a man and his son, who apparently does know some English. The father wants to recruit his son to help us out, but the son must understand enough of the little hand sign show to know there is no way HE wants to be involved in this. Finally, the pharmacist hands me a box of capsules and explains, “Two at the beginning, and then one at every incident, but no more than six a day.” Wonderful. I then turn again to what are now abundant yellow arrows heading to the town’s only albergue and bar, and I sit in the hot sun across the road from the building, with a glass of fresh OJ and ice in a tall wine glass. Elegant for a pilgrim. I call the next town’s albergue and make a reservation and head out, after not catching the OJ/wine glass that tips in the wind, smashing onto the rocks under my table. Picking up the pieces carefully, I carry the glass back into the bar to show the woman what has happened. She smiles and says, “No problemo, senora. Tranquillo, tranquillo.” So I try to relax and thank her before resuming my day’s walk. At some point I get to Rabe de las Calzada, a sweet little town with one bar and two albergues, as well as the requisite church or two, a Catholic school for adults and children (carved right into the stone above the door), which is also some sort of convent. At the Albergue Liberanos Domine the pretty dark-haired owner takes my documents, stamps them, tells me where to put my shoes and poles and shows me a bed. She will serve dinner at 7:00, and the cost is 8 Euro, same as the bed cost. Fortunately, I don’t refuse, but I do go down to the bar, owned by her brother-in-law, I think, to have some Sangria (they put Anise liquor in it this time. Bleah!) and use the bar’s wifi (wee-fee, the way it’s pronounced in Spain). I actually order cheese and of course bread. But really, cheese! Just plain cheese, and some olives. Heaven. I even drink the anise-dosed Sangria, though I hate the taste of black licorice and that’s what anise and anisette do to anything. But dinner . . . begins with a most magnificent tasting saffron soup with short pieces of vermicelli in it. I have two bowls. The best thing about Spanish food in my experience seems to be the soup, and this is the best soup I have tasted since I’ve been here. 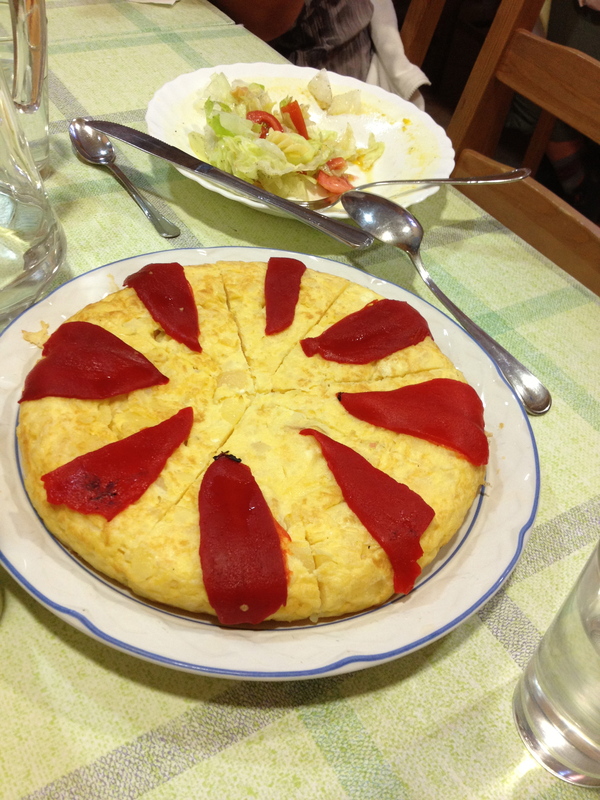 The next course is what the Spanish call a Tortilla . . . like a quicke without crust, but typically it’s loaded with potatoes, and I’ve had enough potatoes, along with the barrels of bread I’ve been served in the past nearly three weeks. This, on the other hand, is mostly eggs, and is decorated with roasted red peppers on top. Yum. The dinner always seems to be followed by a dessert choice in a plastic cup. Ice cream Sunday, yogurt, Creme Caramel . . . typically store-bought in bulk. Ah, well, I am too full for dessert anyway. I wonder what I’m going to do with mine, and say so to someone next to me. She turns to me in all sincerity, and says, “But it is a gift they gave you. You keep it.” And I do. I make sure I’m fairly well-organized before I go to sleep, bottles full of water, nectarine in my pack. 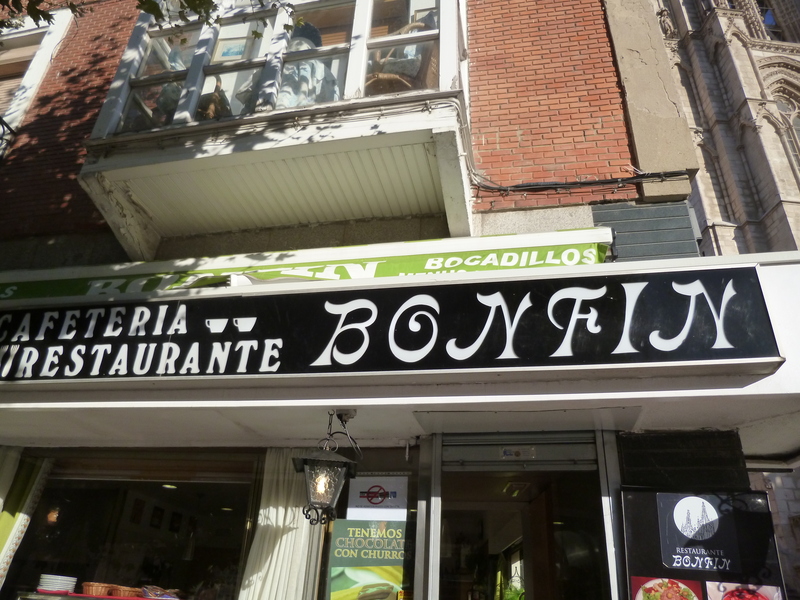 Tomorrow, Hornillos, Hontanas and the Meseta, clearly marked in Brierley’s book. Get that one over with, check it off my “to do” list, and move on. Ha. 7 Responses to Getting To The Front Edge Of The Meseta . . . While in Spain many years ago, one of the girls started her period. Fred went to the Pharmacia to try and explain what we needed. TooToo funny. So know what you are talking about. Would not let me go. Could it be the eggs that you love so much? Nah, not the eggs. I’ve gotten so few of those, and I eat them four times a week at home with no problem. Might be all that BREAD, though, or the high end walking or the water from such a variety of towns or or or or . . . perhaps just a genetic gift from my mother! Quiero acompañarte! I love your stories! I saw your blog link on Facebook ( I leave in four days for SJPdP) and have spent Easter Sunday morning reading through it. You write so well, and no bs. Thanks so much for your comment. I hope you find my site helpful. I wish I were going again now, but I have to wait until next year. If you have any specific questions or want to talk, send me your e-mail through this reply link, and I’ll call or e-mail you. Or a FB message. And have a great walk. I hope you have Brierley’s book. Are you going with a group or solo?